King County monitors the ecological health of Idylwood Creek in a variety of ways, including collecting and analyzing water, sediment, and benthic invertebrate samples. Water quality samples have been collected monthly at Station A620 located at the footbridge in Idylwood Park. Sampling at this site began in 1995 and continued until 2008 when budget cutbacks forced King County to reduce the breadth of its water quality monitoring program. Sampling at this site resumed in February 2013. Sediment samples have been collected from Idylwood Creek as part of the Streams Sediment Monitoring Program starting in 1987. King County began collecting benthic macroinvertebrate samples in Idylwood Creek in 2002. From time to time, additional studies have been conducted on Idylwood Creek. Click here for information about Special Studies. The Idylwood Creek watershed is located at the northwest end of Lake Sammamish in the City of Redmond, Washington. Headwaters of the creek originate in the City of Bellevue, Washington. The creek drains into Lake Sammamish roughly 50 feet north of the swimming beach area in Idylwood Park. Land use in the basin is almost entirely developed with not much forest and no agriculture. There is also no scrub or wetlands and less than 1% of other land use (open water). Development is mostly low to medium intensity and evergreen forest is the most common type of forest present. See Table 1 below for more details on land use. From 2000 to 2015, volunteers with the Salmon Watcher Program made observations at various locations within the Idylwood Creek basin. Sockeye salmon were observed in Idylwood Creek, though there presence was very rare ("Stream List," 2016). 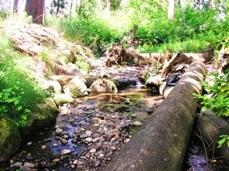 No fish were observed in Idylwood Creek during the 2004 observation period (King County WLRD, April 2005). State water quality standards were revised in 2003. Idylwood Creek is now categorized as “Core Summer Salmonid Habitat” for aquatic life use, and “Extraordinary Contact” for recreational use. As part of the updated water quality standards, portions of Idylwood Creek have been assigned an additional "Supplemental Spawning and Incubation Protection" temperature criteria of 16 ºC. The creek is on the Washington State Department of Ecology's (Ecology) 303(d) list for violation of DO, water temperature, FC bacteria, and bioassessment standards (Category 5). A Water Quality Index (WQI) rating system was developed by Ecology that evaluates several water quality parameters and gives a single rating of “high,” “moderate,” or “low” water quality concern. To see how Idylwood Creek ratings compare with other stream sites, please visit the Water Quality Index webpage. King County is not currently operating any stream, rain, or temperature gages in Idylwood Creek. Sediment data were collected from Idylwood Creek as part of the Stream Monitoring Program starting in 1987. Data were compiled and analyzed for the years 1987 through 2002. Data were analyzed for trends, correlations, and were compared to sediment quality guidelines. No significant trends were identified during data analysis for any of the parameters tested. Results indicate that Idylwood Creek sediments exceeded on sediment quality guideline (nickel). Of the 27 streams monitored in King County, Idylwood Creek had the 7th lowest metals concentrations. For more information about benthic macroinvertebrates and King County’s Benthic Macroinvertebrate Program, please visit the King County Stream Bug Monitoring webpage. To see the benthic macroinvertebrate data for Idylwood Creek, please visit the Puget Sound Stream Benthos webpage.